The renovation of the Robert I. Schattner Clinic and construction of the Schattner Pavilion for Penn Dental Medicine at the University of Pennsylvania is the culmination of facilities projects underway since 2015. The project includes modernizing a 13,000-square-foot teaching clinic and associated ancillary spaces. The 4,700-square-foot, two-story addition houses a new student lounge and much-needed patient waiting space. 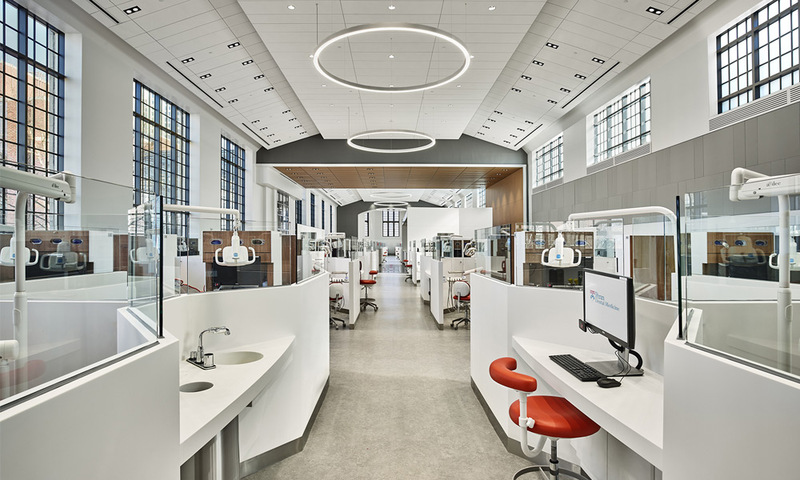 The clinic design creates an environment for 74 individual operatories optimized for teaching techniques via “four-handed dentistry.” The upper glass panels and custom cabinetry provide open sightlines for faculty supervision while maintaining patient privacy and reducing noise levels. The large clinic volume is anchored by the centrally situated Patient Care Pavilion that provides a sense of arrival and serves as hub of clinic operations. As homage to the character of the original Thomas Evans Building, circa 1917, ceiling shape and large chandeliers are informed by historical photos. A high-performance curtainwall with custom profiles is used to recreate a wall of windows that provide northern light, making this flagship clinic a positive environment for both teaching dentistry and patient care.